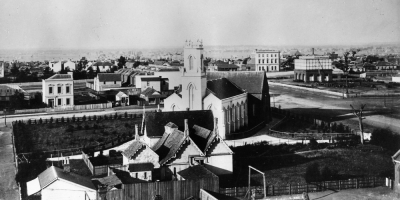 The 'Melbourne Lying-In Hospital and Infirmary for Diseases of Women and Children' opened its doors to the poorest and most needy women in 1856, less than two decades after the official foundation of Melbourne (1837). The Lying-in Hospital was the second hospital established in the bustling town (the first was the Melbourne Hospital). 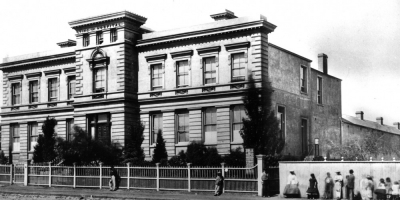 It was first located in a leased terrace house in Albert St, Eastern Hill (East Melbourne), close to where the Victorian Parliament now stands. The hospital’s establishment was achieved by a committee of women, led by Mrs Frances Perry, the wife of the then Anglican bishop of Melbourne, and two doctors, Dr Richard Tracy and Dr John Maund. In 1858, the 'Lying-in Hospital' was relocated and opened in Madeline St, North Melbourne (now known as Swanston St, Carlton). Photographer unknown. Two years later, the hospital moved to a site in Carlton with financial support from private benefactors and a colonial government cashed up from goldfields taxes. In 1884, its title was simplified to the Women’s Hospital and the ‘Royal’ title was conferred on the hospital by Her Majesty Queen Elizabeth II on 6 September 1954. Most sought assistance when giving birth or recovering from its after-effects, or when plagued by troublesome or life-threatening gynaecological conditions later in life. 1958, babies at the Henry Pride Wing, Kew. The post-war baby boom placed the Women's under enormous strain. A new wing was built in suburban Kew where new mothers and their babies were transferred for several days. Photographer unknown. 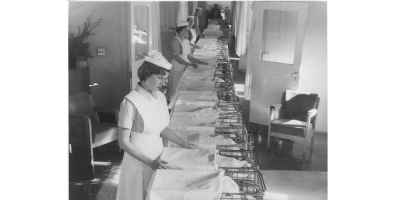 Demand for the hospital's services was strong and sustained and in its first decade nearly 3,000 women were admitted and many more treated as outpatients. By the second half of the twentieth century, more women gave birth in the Women's maternity section than in any other hospital in the Commonwealth. By the end of the twentieth century, the hospital's neonatal intensive care unit was among the largest and most sophisticated of any in the nation. From the outset, the Women's aimed to lead in setting standards for medical and nursing care, becoming the first Australian hospital to train nurses in the late 1850s and to teach obstetrics and gynaecology to medical students (1865). The hospital maintained close relations with the University of Melbourne medical school (established 1862) and was the first hospital in Melbourne to house a clinical professor (Robert Marshall Allen, Professor of Obstetrics, 1929-46). The Women's was also the first place in Australia where a specialist Diploma in Obstetrics and Gynaecology could be undertaken (from 1932). For more than 150 years the Women's has provided specialist care for women and newborn babies; sometimes based on its own ground-breaking research. Today, the hospital is renowned for its expertise in areas such as antenatal care, maternal and neonatal infection control, gynaecological disease diagnosis and treatment, family planning, newborn intensive care and infertility management. In all these fields, the Women's seeks to enhance the well-being of individuals and families while, at the same time, responding to changing community needs and priorities. On 6 October 2003, the Victorian Premier and the Minister for Health announced that a new Women’s hospital would be built in Parkville. Construction for the new $250 million Royal Women’s Hospital began in 2005, heralding a new era in healthcare for Victorian women. The Women's moved to the Parkville site in 2008.